The Annual Spirit of the West Cruise! Join Hugh and Billie McLennan on the annual Spirit of the West Cruise! 2019 Spirit of the West Cruise! Our 2019 diary and photo page has been started. Click on the 2019 link above. Read some testimonials from past cruises here. April 25th in Red Deer, AB ... See the information below! The Spirit of the West is available at no cost to local radio stations. For more information contact Hugh McLennan at the info provided below. This is not broadcast quality but you can listen to a "Spirit of the West" Demo in a "Streaming MP3" format. "Crown Princess"! An all new cruise for us where we'll see all new ports of call. 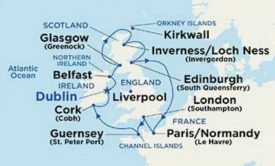 * An optional post cruise package is available ... a seven day post cruise Ireland coach tour. See the Post Cruise Flyer here! This will be the 18th Annual SPIRIT OF THE WEST CRUISE! August / September 2019. The following is tentative - it should be very close though! valuable networking, and private group excursions. Spirit of the West Cruisers reacquaint with past cruisers and friends at the Cruise Reunion in Westerner Park, Red Deer, Alberta the same weekend and location as the Mane Event. April 25th, 2019 from 5:00 pm till 8:30 pm. Take in some music by Hugh McLennan and the Western Spirit Band while enjoying the refreshments and snacks on hand. See the Cruise Reunion Flyer ... Click Here! Here's what some folks on past cruises had to say! The 2009 Spirit of the West was our second, and probably, hopefully anyway, not our last. Both crusies were what we considered trips of a lifetime. We had a super time! It's hard to put such an enjoyable experience into words. The fact that there were so many like-minded people in our group made the Spirit of the West cruise very special, something that no other cruise could offer. Thank you for another Spirit of the West Cruise (this is their sixth cruise) - what a great group! It was nice to catch up on everyone's news and meet still more industry related folks. Coming home with a bit of tan is not bad either. Thank you both so much for giving us yet another (once in a lifetime) experience. A holiday that we could not even have dreamed of. Thanks so much! We basicaly came on the trip because Dad wanted to see the Panama Canal - he heard it on the radio show. He said "we should go" ... Well I wasn't about to argue with that so I grabbed the phone. It was a wonderful time. Andrew and Kathy were great. I found the presenters to be informative and well presented. Enjoyed the cruise and enjoyed the people. Appreciated all the events set up to enjoy - appreciate Jim & Karen and their time to set everything up, thank you! Enjoyed the sing-a-longs and Hugh's poems. Enjoyed Anrew's harmonica, lyrics, and humour! Thank you both. Great tour in Costa Rica thanks! Speakers topics were good - very informative. Conference speakers informative - topics OK. I am personally interested in the cattle and ranching tours. We thought about booking on our own but didn't, and we're glad we didn't as it was like we thought ... we would never have had such a good time. We would have missed the network of fellow ranchers and Spirit of the West listeners. We would have missed the presentations that were not only educational but were a lot of fun. No one could have ever had a coffee tour like we got in Costa Rica. It was super as was the trip to get there - what a great way to see the country! The cattle ranch tour was good too, very interesting. Wish we'd had more time there but guess we can't win 'em all. For our next cruise we'll definitely be with the Spirit of the West and will definitely book with Jim and Karen again! Thanks for making this cruise an annual event. Conference was very much appreciated and interesting. We tried to book on our own thinking that we would save some money. It didn't work - it was so involved and complicated we gave up and booked through Jim and Karen ... and sooo glad we did. What a super time! The Panama cruise was excellent. What an incredible place! The Caribbean, too, - we've never been there before and the sun shone every day! Sure beats January at home all to heck! Thanks for making this cruise possible to your radio show listeners! Oh ya - we love the show, too! Enjoy warm days with the company of friends, ranchers, and Spirit of the West listeners. To see photos of the 2008 Cruise have a look at the: 2008 Diary Page! To see photos of the 2009 Cruise have a look at the: 2009 Diary Page! To see photos of the 2010 Cruise have a look at the: 2010 Diary Page! To see photos of the 2011 Cruise have a look at the: 2011 Diary Page! To see photos of the 2012 Cruise have a look at the: 2012 Diary Page! To see photos of the 2013 Cruise have a look at the: 2013 Diary Page! To see photos of the 2014 Cruise have a look at the: 2014 Diary Page! To see photos of the 2015 Cruise have a look at the: 2015 Diary Page! To see photos of the 2016 Cruise have a look at the: 2016 Diary Page! To see photos of the 2017 Cruise have a look at the: 2017 Diary Page! To see photos of the 2018 Cruise have a look at the: 2018 Diary Page! To see photos of the 2019 Cruise have a look at the: 2019 Diary Page!